By the end of 3rd day, after more time spent in the taxi, it was decided that Mussourie was totally out of question during this trip. 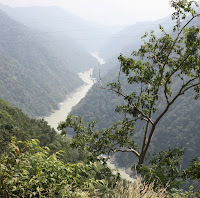 Since we had been to Tehri Dam and lake and this was on Bhaghirathi river, we enquired about the meeting point (prayag) of Alaknanda and Bhaghirathi. 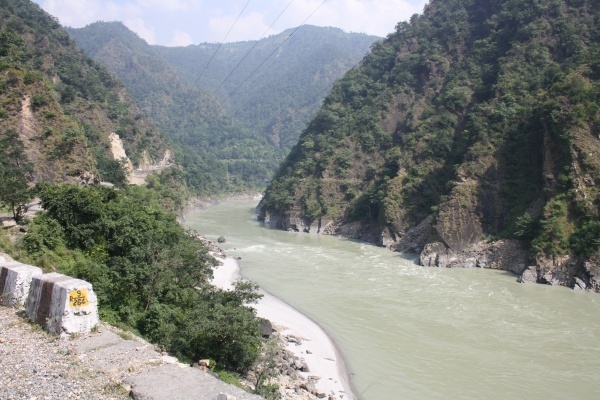 Dev Prayag is the town at the merger of Alaknanda with Bhaghirathi, to start Gangaji from that point on. We decided to go to Dev Prayag and have a dip at this place, since it is only about 2 to 2.5 hours by taxi, through the Shivalik mountains, which are the foothills of Himalayas. 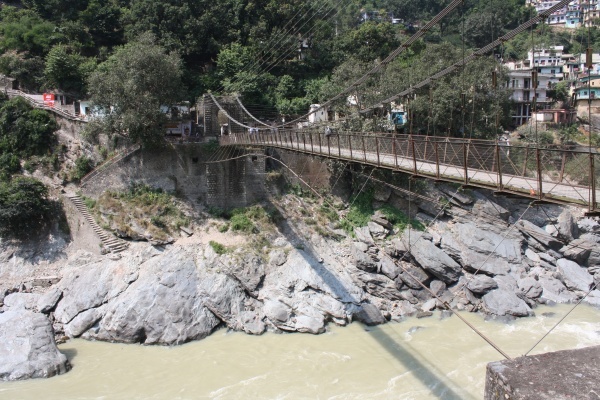 As we progressed on this path, we followed Gangaji all the way to Dev Prayag. The route climbs pretty high into the mountains with the river running in the valley far below (probably a few hundred meters in vertical level). Within 20 kilometers of Rishikesh, we came across a very old rock fall beside which Gangaji was flowing swiftly. There were steps down to nearly the river level and we had to climb over a few rocks to reach a nice silken sand beach along the river. We could step into the river and sprinkle some of Gangaji's pure water on ourselves. The water, without question, was pretty cold. The rock fall and the hang-out of the rest of the mountain was a little scary, but vehicles and people are not bothered. By the look of it, this rockfall seemed to be years old. We stepped back into the vehicle and the climb up the mountains started. There were many breath-taking views of the mountains, land-slides, rocky ledges, winding river with beautiful curves, etc. We stopped at only 3 or 4 spots on the way to Dev Prayag. The time was early for the sun to be vertical and shining into the valleys and hence a 'bright' view of the deep valleys was not possible. 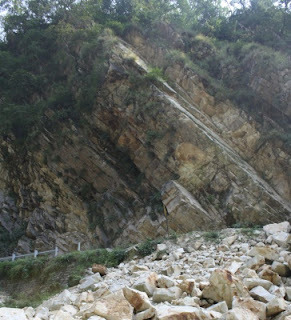 The route also sloped down as we got nearer to Dev Prayag. We reached Dev Prayag by about noon. The view of the two rivers from the highway is breath-taking. The clearer water from Alaknanda comes straight down, while the Bhaghirathi's silt laden yellow flow comes from left. The merger clearly showed a higher water volume from Alaknanda compared to Bhaghirathi, which is a steady one let out from the Tehri Dam. 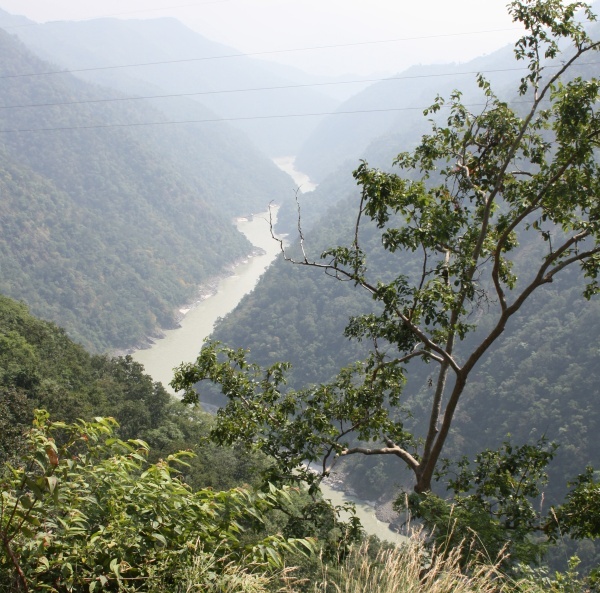 We parked on the highway near a rest-area type shelter and went down about 100-150 steps by foot to reach a hanging bridge over the river Bhaghirathi. As we got close to the water we saw two sentries always at the ghat. Hardly handful of people were taking bath in the small ghat. 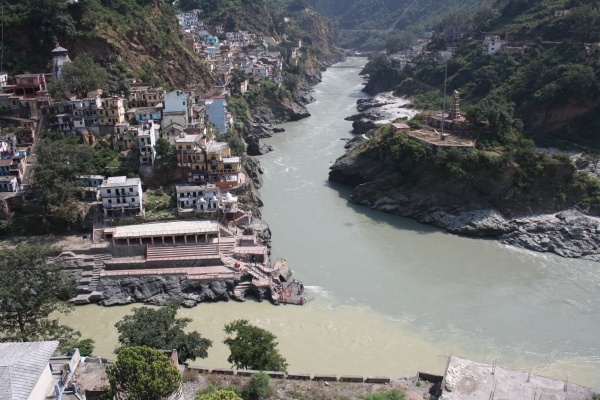 The water from Alaknanda was so swift that it probably was travelling at 15 to 20 feet per second. Hence the sentries were keeping vigil that no one stepped down beyond the first step. Water was rushing by and we felt that if we took a move into the second step we would be swept away. The raw power of the flowing water was awesome to see at close quarters. We collected a small can of Alaknanda water and had a bath as well. We had to sit in about a foot of water and use a container to take a bath - no full dip directly possible due to the swift current. After the exhilarating experience, we dried up, changed and headed back to the parking lot. We were looking forward to the return trip, as we had lot of photos to click and lot more spots to stop and admire the scenery. The sun was right above, lighting up the river and all the valleys. 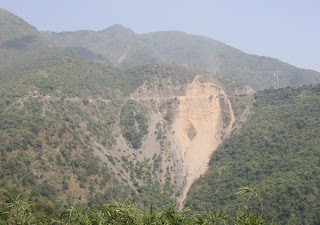 There was one massive landslide, part of which was yet to be removed from our path. This was visible from a few kilometers away on our path. The life goes on in spite of a few landslides every year. It is amazing to see that the people are not worried or bothered about such occurrences. On that day, like the 2nd day, we were not lucky to see the snow-capped Himalayas. The haze at the distance and the clouds at those points hid the snow-capped mountains, as per our driver. 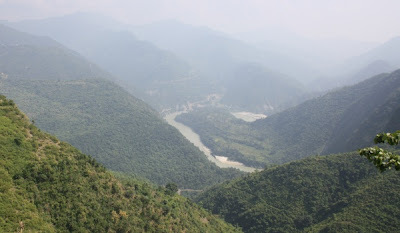 We took lot of photos of the winding Gangaji and the valleys. The miles and miles of mountains, greenery and clear flow of water made us think about even moving there to settle in foothills of Himalayas. We also stopped at the cave ashram of Sage Vasishta, which is on the route between Dev Prayag and Rishikesh. A shiva lingam is kept and worshipped inside the cave. The taxi driver said that caves around that spot lead a few kilometers into the Shivalik mountains and some trekkers had tried exploring and gave up after a few kilometers (and returned). Later we returned to the Divine Resort, which was our base camp for this trip. The details of this resort are available on the internet, including photos, rates, location, etc. We can say that food was excellent, service was very good and the location is awesome. The next day we took the taxi to the Dehradun Airport around 10 AM and we were back to our home by night. Thoughts of the trip seem to haunt us even now - as we are moved by the beautiful scenes, the power of the clean Gangaji and the overall experience of a relaxed vacation.